Save the date! Our 2019 Party with a Purpose in aid of the Maine Children's Cancer Program will take place Wednesday May 22nd 2019 at DiMillo's Restaurant in Portland. This year's event promises to be bigger and better than ever! Library Geeks of the world unite! At today's meeting we welcomed not one, not two, but three new members! A very warm welcome to (l to r) Kath Hall, Liliane Ruvakubusa & Katie Soule. Back Cove Sunrise 5K 2017! The Back Cove Sunrise 5K is back for its second year! 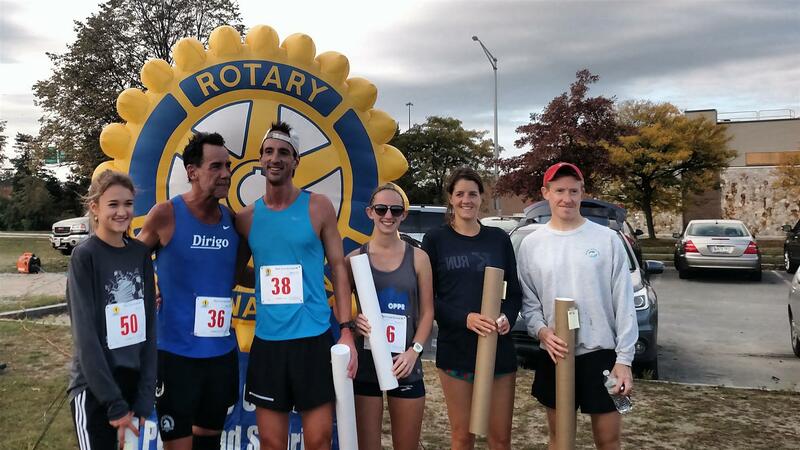 This race on a waterfront trail around Portland's scenic Back Cove raises funds for Rotary's efforts to end Polio worldwide and Portland Sunrise Rotary's service projects in our local community. The starting line for the race will be to the left of the main parking lot across from Hannaford. Celebrating our Interact Club of Casco Bay High School! These students work so hard in and out of the classroom and we are so proud of them! Come to Dimillos on February first and help us raise money for the Maine Childrens Cancer Program. Tickets are available at the door as well as on line. It is the BEST! Fabulous food and drink and an exciting auction, LIVE and SILENT!!! Casco Bay High School Interact Club! We have an Interact club! Save the date! Our 2017 Party with a Purpose in aid of the Maine Children's Cancer Program will take place Wednesday February 1st at DiMillo's Restaurant in Portland. Bob Gravino visited from the Ipswich MA club to present a well deserved Paul Harris Fellowship to his former clubmate Art Howe. Please join us for Party with a Purpose presented by the Portland Sunrise Rotary Club to benefit the Maine Children's Cancer Program. Enjoy complimentary beer, wine and hors d'oeuvres at DiMillo's Restaurant while perusing the silent auction and taking part in other surprises throughout the evening! Earlier this week, the Portland Sunrise Rotary Club dropped off food for Port outreach families in need of support to make Christmas special in their homes. Ten families will share in the bounty. It takes a community! Thank you Portland Sunrise Rotary Club. Garbage to Garden - A Great Idea! 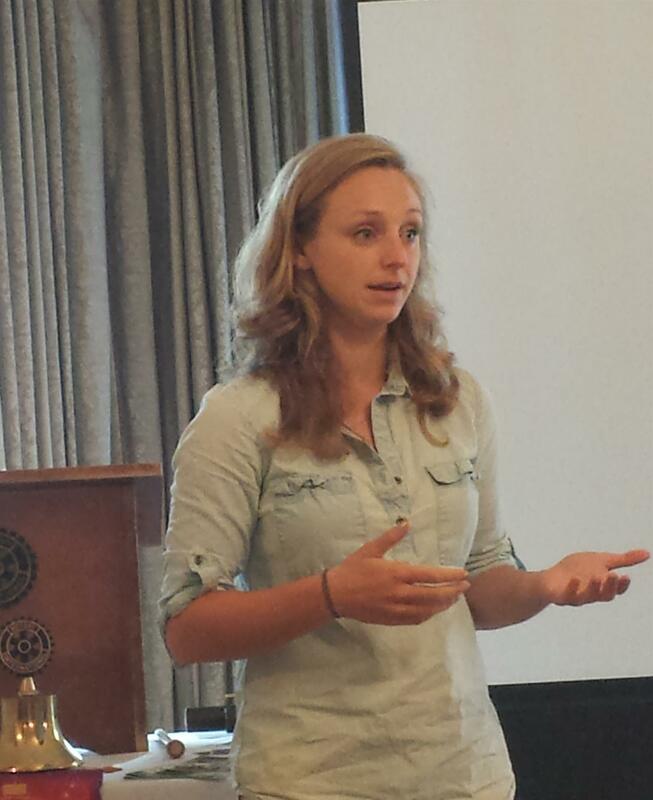 This week's speaker was Kendall Hinckley, Vice President of Marketing for Garbage to Garden. Garbage to Garden is a very innovative service available to households and businesses in the Portland area. For a small fee, food waste is picked up weekly and a fresh, clean bucket is left in exchange. People who want compost can actually get a bucket of compost exchanged, too! It's a very different service and we were all very impressed and full of questions for Kendall. If you missed the meeting, you can check out Garbage to Garden here. 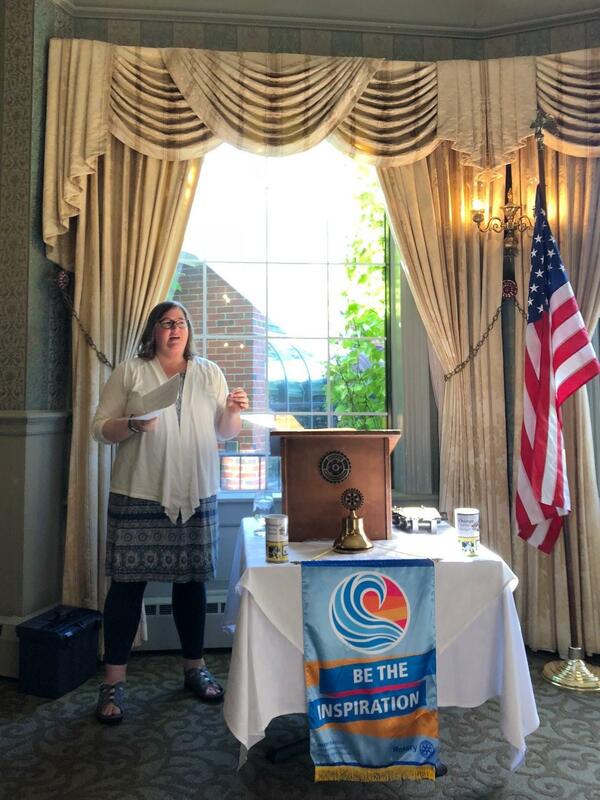 Our August 20 meeting was a rocking one! We were filled to capacity and beyond for our visit by District Governor Sheila Rollins. Please see story below. Ann Lee welcomed our newest member, Dana Tait, into the club and she was pinned by District Governor Sheila Rollins. Club banners were exchanged with visiting California Rotarians.